One of the cornerstones of our business success has been our commitment to innovation. 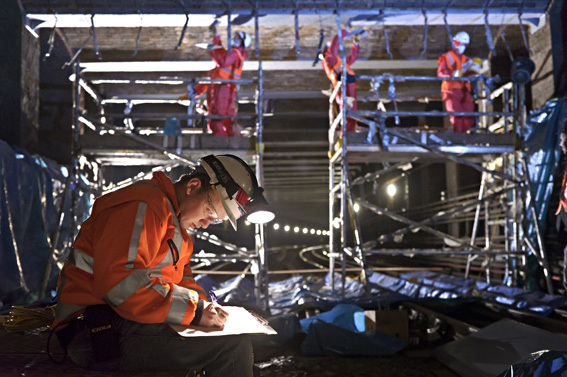 Each year we invest in the development of new techniques and materials for our specialist market sector which enable us to provide innovative engineering solutions for the benefit of our clients. 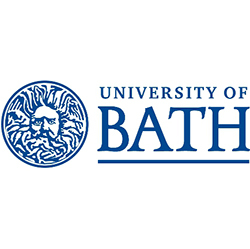 We work closely with UK Universities to help them in their research programmes by providing industrial support and access to our sites for evaluation of the research output. These are recent examples of our innovation both in techniques and materials. 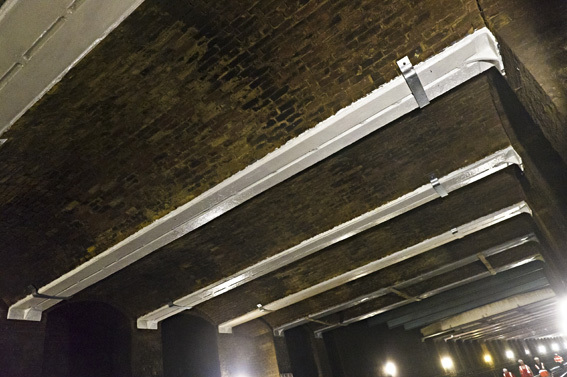 Brick jack arches supported by cast iron beams was a common form of construction for London Underground cut and cover tunnels. 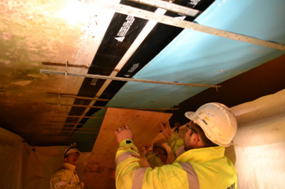 Structural appraisals have highlighted the need to strengthen the beams using UHM CFRP plates. We have pioneered the use of these specialist plates for cast iron beams. Working with LUL we have successfully developed a method to prepare the cast iron and install the plates during Engineering Hours. The company has been using FRP composites for structural strengthening since 1996. In 2014 we were approached to tender for the replacement of an existing timber footbridge. We offered an alternative solution using a lightweight factory built FRP composite bridge at a competitive price. After removal of the old structure the new bridge was installed in under an hour. It weighs only 25% of a conventional timber footbridge and has a design life of 60 years. We have now established a new business, Lifespan Structures, for the design, manufacture of FRP composite bridges. We have developed a design concept for footbridges which is scaleable and the first bridge was delivered to East Sussex CC and installed in January 2015. The bridge was constructed in 1962 and the vehicle safety barrier needed to be upgraded to current loading standards. This required the bridge edge beam to be reconstructed to accommodate the loadings from the new barrier system. 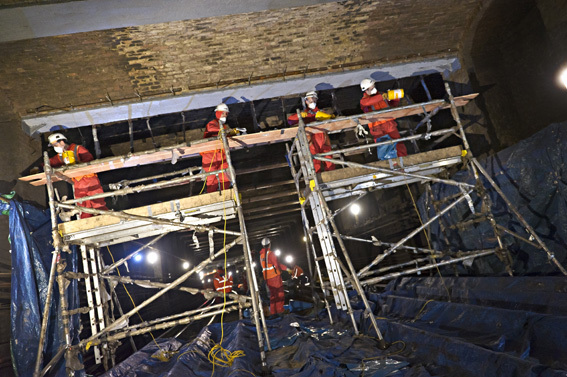 With RMD Kwikform we developed a novel temporary works design which minimised the night possession times required to install the temporary works access across the 48m long bridge. RMDK designed a system utilising Superslim and Al-form, special modular sections to form an over/underslung cantilevered frame which was supported from the centreline of the bridge with a special framework incorporating kentledge. All of the road mounted frames were preassembled on the closed Ash Flats Lane and then attached to the existing bridge deck with the kentledge in place. 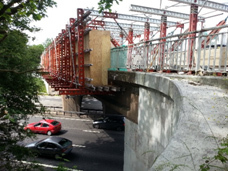 The over slung modular sections were fabricated on the hard shoulder then lifted in one piece during night time closures and attached to the road mounted frames. We enclosed the cantilevered access gantries with a double layer of plywood, silicone sealant to seal the joints and a final layer of roofing felt bonded to the plywood to form a near watertight enclosure. This frame enabled all the work to the edge beam to proceed without further road closures. This project was to install CFRP structural strengthening plates during the cold winter period. The adhesive cure relies on maintaining 30C for 20 hours. The original proposal asked for full enclosure of the work area. This method would have required temporary closures on the M5 interchange due to limited headroom and this was not a viable solution. 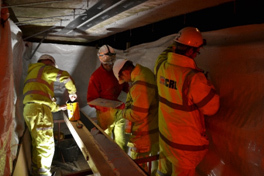 CRL developed an alternative solution using F1 style thin heated blankets to preheat the concrete and control the cure temperature for the resin. 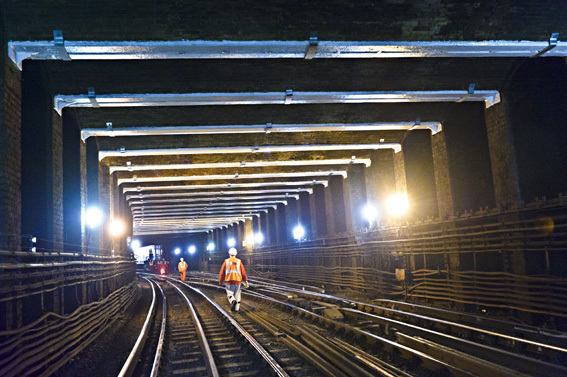 This enabled all the work to be undertaken during night time closures, reduced the programme time and reduced the cost by £100K.